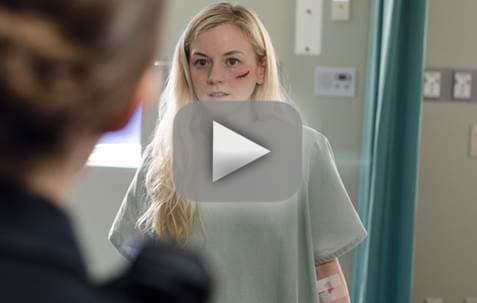 The Walking Dead​'s Beth Greene is alive, and she seems to be well. For now. What's the story with the hospital? And how does Carol come to be there? 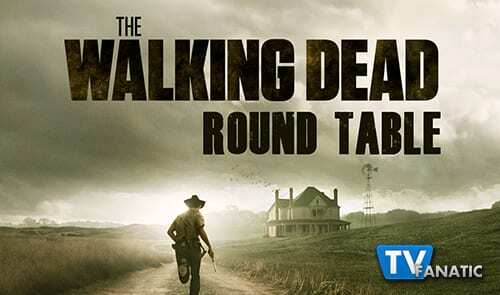 We're discussing that and more in The Walking Dead Round Table! Join TV Fanatic's Carissa Pavlica, Whitney Evans, Sean McKenna, and Miranda Wicker, along with Eric Nordhoff of The Walker Stalkers as we breakdown The Walking Dead Season 5 Episode 4. What was your favorite quote or scene from "Slabtown"? Carissa: For some reason it was watching the Doctor shove the dead guy down the chute. The way he fell and clunked on the side (leaving a chunk of God knows what behind) really fascinated me. More bodies in the chute! Whitney: I found the opening shot of Beth opening her eyes and then looking out over a dilapidated Atlanta really powerful. We've spent so much time on farms and in small little towns, I'd almost forgot there were big cities out there. Showing the city just gutted was a striking image. Eric: The Lollipop scene between her and Gorman. Brutally awkward. Sean: I really liked Beth and Noah escaping in the dark. Not only was I unsure if both characters would survive, but seeing walkers appear after gunshot flashes was a cool spin on the moment. There was something rather pulse pounding in seeing them not knowing what’s around any corner. Miranda: This one goes to Beth killing Gorman by throwing him at a reanimating walker. We finally learned what happened to Beth. What's your reaction? Carissa: It really puts into perspective just how short the time is between episodes. How long have they been on the road now? It felt like a long time since she had been taken, but it was only very short. Other than that, it saddens me that we really think our world will only be ruled by the worst of humanity if we get into groups larger than about 20. That's across the board in entertainment and quite a dismal way to think of ourselves. Whitney: This was not at all what I was expecting. But then again, what else could it be on The Walking Dead? It's another "safe" place, run by a terrible person, thinking they're doing some kind of good. Eric: It was better than I expected it to be. Sean: I was OK with it. Really, I was glad we got a change of scenery and the people around her seemed interesting enough that I wanted to know a bit more about their group. Beth gave us that window into this new world, and we learned she wasn’t turned into Terminus stew. Miranda: Carissa, not knowing how long it's been is one thing that makes me insane with this show. I can totally handle time jumps with something like The Walking Dead, but is it too much to give us a "Two Weeks Earlier" or something? Maybe not giving that information is to make the point that time becomes irrelevant. Meh. As for Beth, I liked getting to see the inside of another group that has survived the ZA. It's always interesting to see the various ways groups have formed and lasted. Carissa: Hovering above the bottom rung of humanity's ladder. Whitney: Slap first, ask questions later. Eric: Dawn’s insecurity leads her to slap easily. Sean: What is she thinking! Miranda: On a power trip like whoa. Are doctors too valuable to kill in a Zombie Apocalypse? Carissa: Anyone who isn't a self involved creep is too valuable to kill in a Zombie Apocalypse. Doctors are important, sure, but so are mechanics. Whitney: I agree with Carissa here. If you're not an awful person, you're valuable. Eric: Doctors are extremely valuable. Their knowledge can mean life or death during the ZA. Sean: Doctors are always valuable because they can help sick people, etc. But normal everyday thinking doesn’t exist in a zombie apocalypse. Survival is key and sometimes two doctors is two too many. Happy peacetime doesn’t seem as likely here. Miranda: I don't think so. Some people are bad people which means some doctors are bad people. In a ZA, I'll pull for Team Good Guy, or at least Team Morally Gray, and if that means doctors die, well then, doctors die. Did Carol allow herself to be taken into the hospital or is she injured? Whitney: I thought at first she was truly injured but now I'm thinking maybe she did allow herself to be taken into the hospital. I'm thinking her and Daryl were able to track the car back to the hospital and maybe they ran into Noah nearby, who told them that Beth was still inside. Then Carol allowed herself to be taken in to help Beth escape. Just a theory! Eric: I believe she is injured for real. We will learn her backstory in the next 2 episodes. Sean: I was trying to figure that out. Would she know how people were taken into the hospital? And Carol is a badass, by no means a weak character, which is usually who was brought in. I just can’t see her being injured, so I have to say she planned this prison breakout. Miranda: I can't see Carol being injured either, Sean, but maybe that's the twist. 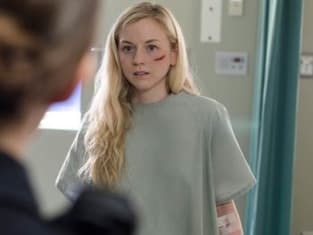 It could just be a broken wrist or something minor, but yeah, I'll go with she's actually hurt but knows what the hospital is and that Beth is there. Carissa: If the person who is with Daryl was in the hospital and escaped, telling Daryl and Carol that Beth was inside, it would be a good reason to assume Carol went willingly. It even makes sense Carol would have gone because they would expect her to be compliant. It doesn't explain Daryl leaving them both behind and taking the other back to the camp, however, unless he plans on bringing the whole group to save Beth. Whitney: If I keep going with my theory, then Daryl has Noah and they came back to the church to get the others and mount an attack on the hospital. Or I could be so very wrong. Eric: Noah. I’m almost willing to bet a good sum of money on it. He gets out to tell him and the others what happened. They come to Atlanta to rescue them both. Sean: I have to assume Noah, especially since he got away. Maybe he found Daryl and will lead the survivors back to Beth and Carol? Or what if was someone we haven’t even seen yet? Maybe some new character? Still, we probably won’t find out next week either. Miranda: My gut says it's Noah, but since Morgan is still lurking in the shadows, it could very well be him. Check out scenes from The Walking Dead Season 5 Episode 5. If you've missed an episode, remember you can always watch The Walking Dead online right here!